Pocomoke City, Maryland, calls itself “The Friendliest Town on the Eastern Shore,” and that includes being environmentally friendly. The idea to put a 2.1 MW ground-mounted solar array on a 10-acre unused parcel of land adjacent to the town’s wastewater treatment plant originated with Mayor Bruce Morrison, after meeting with Standard Solar executives at the Maryland Municipal League conference in 2013 and was impressed by what he saw. At the time, Morrison was a new mayor and one of his many goals was to have a lasting impact on his community. He’d heard positive things about other towns going solar, recognized Standard Solar’s industry expertise and decided to move ahead with the solar project under the day-to-day direction of Town Manager Russ Blake. System will save city and multiple non-profits a combined $52,000 per year. 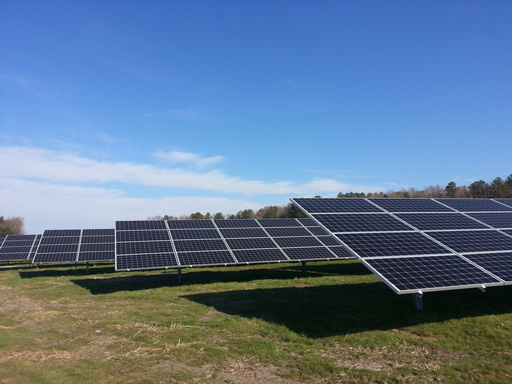 Pocomoke City wanted to have the largest municipally-hosted solar array in Maryland and selected a site they believed most suited to that goal. The town then selected Standard Solar as the project developer, tasking them with maximizing the solar production from the pre-selected site. The project faced some unusual problems, including higher-than-expected interconnection costs, plan-implementation difficulties because of the site’s location, and a vigorous wetland environmental-impact examination by the Maryland Department of the Environment. Standard Solar’s experienced team of engineers, designers and construction workers have seen nearly every challenge solar installations can have. As a result, the team collaboratively explored creative solutions to successfully address and solve Pocomoke City’s challenges. They were able to anticipate—and get out ahead of—the challenges the project faced. Fortunately, although it had its challenges, the site had a significant plus—it was flat and treeless, thereby bringing down installation costs considerably. Through our connections and partnerships in the industry, Standard Solar brought in SunEdison to finance the deal. SunEdison covered the construction and equipment costs and formed a special purpose entity to provide financing and own the project. Standard Solar’s willingness to think creatively, anticipate problems and deliver on time and on budget (the project was finished on Dec. 31, 2014) will help Pocomoke City save an estimated $52,000 per year (approximately 17 percent) on electricity costs. In addition to powering the city, the 6,150 panel array will also power four of the city’s non-profits, including the Delmarva Discovery Center, MARVA Theater, Samaritan Shelter and the Worcester County Developmental Center. Under a 20-year power-purchase agreement (PPA) with SunEdison, the city is more easily able to budget for its electricity use because the price is fixed for the life of the agreement.